Have You Seen Any Blue Jays Lately? When volunteers compared notes after the Pittsburgh Christmas Bird Count on 1 January 2012, someone remarked that they hadn’t seen many blue jays this winter. Everyone at the Pittsburgh CBC Dinner nodded. This morning I remembered that remark and looked through my bird observations to see how often I’ve recorded blue jays. Amazingly I’ve seen them only four times this winter: On November 6 and 13, December 4 and 11. Three of those observations were at the same spot at Moraine State Park and were perhaps the same individual bird. Meanwhile, I have not seen a blue jay in Pittsburgh for at least four months. If the blue jays aren’t here, where are they? Click here for an eBird map of blue jay abundance in Pennsylvania 2014-2019. On an annual basis blue jay abundance peaks in Pennsylvania in September and falls to its lowest point in late February. Click on the [Change Location] button to choose your own state or province. March 2012: I mapped readers’ sightings on The Blue Jay Report here. June 2013: New comments have come in from folks who are seeing far fewer blue jays than they expect. I asked 1,200 observers in Pennsylvania (via PABIRDS) if they were seeing fewer blue jays. Everyone said they were seeing plenty of blue jays but one person commented that 17-year cicadas seemed to depress blue jay abundance in advance of the cicada emergence. If you have fewer blue jays, are you also in a cicada area? September 2014: Lots of blue jays moving south through Acadia National Park on the coast of Maine when I was there in early September. Lots of blue jays in the Pittsburgh area. I have lots in my yard but I live in Delaware. There are about a dozen that feed here thru the winter. I haven’t seen a blue jay bird in about 20 yrs. I live in Rome Ga. I always loved them. They are so beautiful. But others didn’t like them because they were so mean to other birds. I live here in Augusta Georgia and I haven’t seen any Blue Jays in over 10 year’s.. I have seen more this year than I have in probably 10 years. I live in Darlington, South Carolina and as a kid remember seeing them regularly (I’ve live in the same area for 20+ years). Then it seems their population either declined or they took up elsewhere, but I am happy to see them return this year! I see them almost daily l.
Perhaps many migrate like robins do. Has anybody studied this? Has this been a year where their food supply is diminished? Interesting. There are Blue Jays here in DuBois all year-round. I don’t know if they are the same birds or if there is movement of individuals through migration. I have about 5 that come to my feeding area regularly. Huh! Now that you mention it, we’re short on them too. Last winter we had at least four regulars at our bird feeder, and this winter we haven’t had any. I had been chalking it up to a new birdseed blend, but now I think of it, I haven’t even SEEN a blue jay in a while, nor heard one. At our feeders in South Park there seems to be no shortage of blue jays, but a friend who lives near North Park noticed their absence in his yard. Thanks for the update, Marcy. I corrected the photo date. I have several females that hit up my open-trough feeder (the jays seem to own that one… no other birds really get a chance there!). The males stop by sometimes, but I mostly see the females early in the morning. I’m in the east suburbs, if that helps. The only Jays that I’ve seen out here were Stellar Jays up in the mountains. I did the GBBC last week and one of the experts with us said that bird flu did a number on them out here. That birds were everywhere a few years ago. And I’ll ask my dad if he’s seen any in Tarentum, he has a very popular feeder. We have a few up here in the Allegheny Valley near the river. I heard one “queedling” the other day across the street from the river. The strangest Blue Jay observation I’ve had all winter was during a snowstorm in January when one Blue Jay was in a tree across the alley from where I was going to shovel snow for a friend. That Blue Jay was calling just like a Red-tailed Hawk. And I wasn’t the only one who noticed, because the guy who lived there noticed it too. And there was no question who was making the hawk call because we could see the jay doing it. I read something about someone else hearing a Blue Jay call like a hawk too, but I can’t remember where I read that now. I recorded 3 jays twice during the Great Backyard Bird Count this year in Murrysville. So far, have seen 2 this morning at my feeders. And if I recall correctly, Blue Jays do migrate. But some winter in Pittsburgh from further north. Maybe they didn’t have to move this year? Did see just one in Greensburg, PA, last week. Have always had the sweet little juncos, in winter; but, short on them, this year, as well. I live in the Lawrenceville section of the city, I have had Jays all winter taking the roasted in-shell peanuts. We also have a hawk that visits for a meal once or twice a month ( pigeons) and strangely one of the Jays imitates it almost perfectly…I thought maybe he is tryi g to chase the competition away!?!? We have blue jays year round here in south Louisiana, but not as many lately. We also have a few more hawks around so I wonder if the hawks are keeping the jays away. We saw a hawk grab a jay one day, right out of a tree where there was a group of jays. More hawks = less jays? Anyone know about this? The numbers of our other “regular” birds have not changed. Come to think of it, I haven’t seen any at my feeders since December. I’m in Greensburg. Then again, the only birds that have been showing up regularly since then are the sparrows, the cardinal couple that lives in the tree next door and a couple of goldfinches, so perhaps the birds don’t find my yard all that hospitable. I live in the Penn Hills area and have always had between 6 and 8 blue jays feeding off and on during the day at my feeders—-except for this winter when I have absolutely none!! Twice during the winter I have seen one lone jay stop at my one of my feeders..but it only stayed for a moment or two. They used to always watch for their favorite treats, “peanuts in the shell”, but even that doesn’t bring them around this winter! I haven’t seen many this winter, but I did count one during the Great Backyard Bird Count last weekend, about 2 blocks from my house in Swissvale. They all must be at my house in New Castle! They have been here pretty much daily all winter, and I’ve been seeing as many as 5 at a time in various trees near the feeders. Here in Western Kentucky they are plentiful. One difference this year is that I only put our feeders in the winter when I feel the birds might need help finding food. This winter has been so mild the blue jays seem to be finding enough in the field and are not visiting the feeders. I’m staying near Uniontown PA and I have at least two visiting my feeder daily. I agree with you. I normally have at least 4 – 6 up every morning. I only see one hear and there. I saw one this weekend at my feeder. I just assumed that they haven’t been coming because of the mild winter. I live in North Versailles. Normally when I put the peanuts out they start calling each other. Lots here in Northern NY where they go crazy when I put out the in shell peanuts into the tray feeders!! I would say at least 10 have been seen at the same time, but I have a feeling there’s many more. And as I type this at work I can hear them at the feeder outside! I’ve had a pair visiting my yard in suburban Lancaster county every day since I got my heated birdbath for Christmas. Since I have the added variable of the birdbath, it’s hard to tell if this marks a broad trend of Blue Jays moving away from the city or not, but it may fit your observed trend. I have 4 Blue Jays in my yard all winter. I live in the Penn Hills area, closer to Churchill. The one Blue Jay that I believe was born last spring only has one eye. I have 16 Cardinals also in my yard. One female has white head. I have several bird feeders with a mix of corn and sunflower seeds and a large pond. I am also very excited to see that a pair of Red Tail Hawks building a nest outside my kitchen window a top a pine tree. Not many jays in northern Washington County either. A few scattered here and there, but not the usual number. I too have heard the jays imitating a red tail. The sound is almost identical. When I hear this I stop and scan the trees and usually find a jay looking back at me. Does anyone know the reason for this? I have also noticed that the blue jays and crows seem to hang out together in my neighborhood. Is this an unusual friendship or just coincidence? I just took a few pics yesterday , with Blue jays eating Peanuts I gave them. They are pretty brazen, and will come right up to me to get them. I have heard that jays will give the hawk call in order to clear other birds from feeders. I have seen it work for them! I live near Rural Valley , PA, around an hour and a half from downtown Pittsburgh. I just put bird seed out yesterday and one of the first birds in was a blue jay. Noticed the same thing near Washington, D.C. It seems like they are usually around during the winter, but not this year. I have seen 3 in recent weeks that come once or twice a day to my feeders. If I put out peanuts, they always come. I can hear them calling in the distance…alerting any others that there are peanuts for breakfast at the Spurrier feeders. In years past had many more. Forgot to mention that I live in Virginia Beach, Va. Here is north central Arkansas we have them year around. I am not a good lister, none showed up for the GBBC, saw a couple a day or so ago and heard them yesterday. We live in the most northwestern area of NC and we have not seen any Blue Jays this winter either. Where do they go! We saw a total of 3 blue jays at one time during the GBBC, and saw at least one every day during the count. There’s one outside the window right now. It does seem that there are fewer of them . . . We’re located in SE KY. We hope you’ll visit our web site and friend us on Facebook at http://www.facebook.com/GreyhousePhotography. I live in NE Florida, and although I do still see and hear Blue Jays, I have noticed a decline in numbers recently. During the GBBC, I could hear them, but did not actually see them, so I was unable to submit any data. I’m happy to report that I have already seen one at my feeder this morning. I have 5 here in MN.. Been here all winter.. But I have noticed a major decline in all the birds at my feeders this winter.. I didn’t have much to report for the gbbc, but I did it.. Is all this mild weather really screwing them up? I, also live in DE. I have seen up to 6 blue jays in our thicket, at the same time. We have a great thicket, we have 6 different bird feeders around. No squirrels, ever. Hoping to see more Blue Jays, esp. babies. Here in Western New York, they’ve been coming around all winter and seem especially fond of the bark butter I put out for the woodpeckers. I have some wintry photos of a rather wind-blown Jay posted here: http://www.chirpsandcheeps.com/BirdBlog/A-Blue-Jay-on-a-Blustery-Day.html. In my backyard in Pennsylvania on the outskirts of Philadelphia. We have had tons of them…when we put out peanuts! We are in southern Indiana, and when there are peanuts in the feeder, there is a constant group of about 6-7 beautiful blue jays. Not sure where they hide when there are no peanuts. Inner coastal NC on the Pamlico River. No I have not seen any here lately and have seldom seen them here. They don’t seem to do well in an area filled with Thrashers, Catbirds and Mocking Birds. There are plenty here near Burlington, Vermont. Just saw a few pairs in Colchester and South Burlington last week. My dad has seen one Blue Jay in Tarentum, and that wasn’t until just this past weekend. One of my favorites, he comes to my feeder daily! This year I’ve had them off and on in coastal SE NC. We have lots of blue jays up here in Ottawa, mind you we keep them well fed during the winter. I must be honest though, I don’t think we have as many as we normally have hanging out on the feeders at this time of year. My blue jays disappeared shortly before I began counting for project feeder watch – mid November. I have one that occassionally comes but in years past I typically would have 6 or so at a time. The ones I feed at my office (in Tarentum, PA) also disappeared except for 1 that comes once in a while. I assumed they were managing on natural foods given the mild winter we have had. I am located 10 miles east of Pittsburgh, PA. The blue jays are all in Florida. So, apparently, are the robins. Maybe after last winter, they were a little hesitant to go back north! There were 2 in the yard in No Colorado yesterday with their usual gang of thugs. 4 magpies, 2-4 bluejays, a flicker and sometimes a kestrel show up an make a ruckus! I can’t decide if they are allies or are fussing at each other. Things were quiet when we had west Nile come through a few years ago. Things are back to a noisy routine again. I can hear them all travel the neighborhood together. Woo hoo! I just saw my first blue jay in the City this winter! He was heading north! I live about an hour and a half northeast of Pittsburgh, Pa. and have recentlu been noticing blue jays in the trees in my yard. I put sunflower seed in my feeders so blue jays are frequent visitors. With the recent weather, 50 today, 12 4 days ago, I believe all the animals are unsure as to where to go. Think we may have some early baby animals and birds this year. We need to start to take better care of what we do to this wonderful earth of ours. I live in Rhode Island, I have feeders and suet out all winter and have not seen a blue jay since November, its now March 1st 2012. We usually see blue jays everyday, this is how I found this forum ! I just heard a pair calling in the Schenley Farms neighborhood. Hearing the calls made me realize how silent it had been all winter. I’m in Rhode Island too, and while i have lots of other birds, I haven’t seen any blue jays in ages. I don’t miss their aggressiveness, but it is strange not to see them. Hi, I live in the Blue Mountain area of eastern PA, just above the Lehigh Valley. Over the years I have had a constant flock of at least 14 pairs living in the conifer around my home. I noticed their disappearance around this past summer, 2011. I find it very strange that an entire group would just vanish. There has not been one around our yard since. The other birds have maintained though it will be interesting to see about the migratory ones. I have not had the variety this spring as in the past 6 years here. I hadn’t seen this post earlier, but just to add to the question — we noticed a distinct decrease in the number of Stellar’s Jays around the North Lake Tahoe (CA) area this past summer. Usually they are hopping about, and we hear them wherever we go up there in the summers, but this year we only saw 3 during our 2 days there, and we heard one other one. Strange to find it so quiet, and we missed their personalities, which always add a lot to whatever is going on in the neighborhood when we venture outside, or sit outside having meals. Did anyone ever come back with a reason for the drop — or is a study being done to find an actual cause for this? I will say that the scrub jays are still fairly common in our neighborhood in the Central Valley, but we have seen a big drop in the number of crows and magpies due to West Nile attacks during the past couple of years. Not many robins here anymore either, but that is most likely due to hawks, falcons, and definitely cats — lots of cats, both pets and ferral — that are allowed to run free and kill many of our beautiful birds. I live in Cornwall on Hudson, NY.. I’ve been feeding the birds all winter and haven’t had one Blue Jay. I had jays at our place in the central Adirondacks last summer, but not to have them here is very strange. We are surrounded by protected state land, so habitat isn’t a problem. From all the blogs that I have been reading, here and on other websites there seems to be something going on that has caused a very dramatic reduction in the population of this bird. Only one blue jay has come to our feeder in the last two years. And he was just passing by. I live in Somerset, PA. I’ve missed them and wondered why they seem to have disappeared. We were wondering where the blue jays have gone also. We have always had MANY & the minute there was new food, they were there. We have not seen any here in North Brunswick NJ at all. My other half swears it’s been since Sandy but I can’t say I can recall when they disappeared. I have emailed Cornell Ornithology Dept & the guy who writes the birding column for the Star-Ledger (NJ paper) and neither have responded. I also spoke to an Audobon rep who lives in northern NJ & she has noticed the decline also. I would really like to know what is going on. I don’t know what’s going on where you live, but I can guide you to ebird.org that will show you where the blue jays are this winter. Go to http://ebird.org/ebird/map/, enter Species “blue jay” and Custom date range of “Jan to March” of the Current Year and you’ll get a color coded map of the sightings of blue jays in the past few months. If you put in your location you can also see who where blue jays are near you. This morning, March 26, I suddenly saw more blue jays in my Pittsburgh neighborhood than I’d seen for a long time. They must have come in overnight. Thank you Kate St. John, there are some in the area per the map but not many. Still a mystery. I do miss them even though they’re bullies! About an hour and a half after I checked this site, I was in my garden & heard a familiar screaming. I looked up & there was a blue jay! I hurriedly filled the sunflower seed feeder & threw some on the street but by that time, the jay had flown up the street screaming. It was like it was saying “Hey I’m here!” Amazing! I live in North West NJ. This year I saw only two Blue Jays… The normal amount would be close to 100, So I just was wondering and found this site to find out why? I was thinking that the Gov has started using DDT again, I hope not. Any one with the answer as to why we have so many LESS blue jays please let me know. I’ll be checking back here from time to time. Thanks. I live in Saylorsburg,Pa. I have seen no blue jays. I always had lots and lots of them. Now none. Where are they? I miss the noisy birds. And they were around all year. I live in Northern VA and I don’t think I’ve seen any this year at all -or over the winter (2012-2013). That’s how I found this site. The Grackle’s seem to have replaced the Blue Jays in my back yard. Kim, we have many blue jays in Pittsburgh this summer. They cause a stir whenever they get near other birds’ nests because they’ll eat the eggs and nestlings. I have not seen one in Southern WV for quite some time. This is very strange. They are vanishing. I know that this is an older post, but over the winter of of 2012 we had dozens of jays here at our home in Chambersburg, PA. In early spring of 2013 we continued to have a lot of jays and started to find a lot of dead fledgelings around the house and neighborhood. Now we don’t have a single jay. I still put peanuts out and the same food and yet we don’t have a single jay. The neighborhood is quiet. I miss our jays! Any idea what happened or where they might be? “Dead fledglings” sounds mysterious, especially if you found bodies. Predators would have eaten them, leaving no bodies behind. If there were a lot of dead nestlings — not just one or two — then my guess is that a new disease or poison/pesticide happened in your neighborhood this year. Jays disperse after the nesting season. If your neighborhood was bad for jays this year they wouldn’t stick around. We’ve been feeding birds here in rural Fulton County NY for many years. There have always been dozens of blue jays year round up until about a month ago. Now we have none. We are not aware of any environmental changes. The food is the same. We haven’t seen any dead birds. The feeding area is very quiet without them. Would that many well fed birds just pack up and move? Janet, yes your blue jays have probably “packed up” and migrated. Blue jays are on the move this month and though yours have left you might gain some blue jays from further north who will decide to stay for the winter. On the other hand… I’m not sure why blue jays would be continuously in your yard in prior years & then have a gap in their presence this year. It’ll be interesting to see what happens next spring. Thanks for your input. I will let you know if the northern cousins arrive. I found your website because I was wondering where the blue jays went. Manhattan, NY – literally in the middle of Manhattan, I feed mourning doves and blue jays on my fire escape. There is a tall tree very close by where they can perch. The most blue jays I’ve seen together at once was 3 or 4 this summer, and have grown quite fond of them. I haven’t seen nor heard them for a week and was wondering if they had migrated due to the temperature getting colder… or maybe it’s because I had run out of peanuts for a week. Just put out some black sunflower seeds, hope to see them soon or at least when they come back if they’ve gone to warmer places for the winter. I live in western NC and have had lots of Blue Jays up until about a month ago and now I have none, whenever I put out my food they would come screaming in from all over and now I have not seen one. In past winters they have continued to stay here and feed out of my feeders. Anyone else in western NC experiencing this? It has been driving my husband nuts that the blue jays here have disappeared. We live in the area near Michaux State Forest, south central PA, and have not seen a jay for well over a month. I live in the northern part of Va. in the northern Shenandoah Valley. Every year I feed birds out on the deck and every year Blue Jays come flocking in and knock all the other birds out of the way. Not this year. Not one Blue Jay has shown up during the frenzied feeding. Not one! It is so weird that I put it on Facebook to find out if others have noticed this at their homes. I have no answer to this unusual situation. Blue jays have been noticeably absent here in south central PA. We have established feeders with all kinds of beautiful birds, but NO blue jays. We have been talking about this lately and realizing that we’ve seen none for some time. I would really like to know what is going on. A few years ago blue jays were a regular sight. Aggressive, noisy and beautiful. We see cardinals, pigeons, titmice, woodpeckers and more. But no blue jays. Where have all the jays gone? I am glad to see it is not just in my area. I am in south western PA and I haven’t seen or heard a blue jay all winter. There doesn’t seem be any less of all of the other winter birds like cardinals, juncos, etc. Paul, there are blue jays at Schenley Park. Even on the last two very cold mornings I’ve seen at least 5, especially near Phipps. Maybe they’ve all moved to town. Growing up in Indiana, Blue Jays were always abundant year round, and would aggressively dominate any bird feeder when they chose too. Typically, they would rake all the mixed seed to the ground to get to the sunflower and saflower seeds. I currently live in Kentucky, and typically the same species tend to proliferate here. I have observed jays here regularly, but not as plentiful. That is, up until a few months ago. It seems that the jays, chickadees, and nuthatches have all gone missing, even though the other species have been vigorously excercising the bird feeders. There seemed to be a large population of foxes this past summer in Monmouth county, I think this might have something to do with it. Also a lot of hawks this past summer. I noticed a lot of jay feathers in and around my wooded lot. I’m quite a ways south of most of you folks, and the jays are simply gone from this area, have been for the last three or four months. I’m in Romney, WV, about 30 miles south of Cumberland, MD. We have the usual winter cardinals, juncos, titmice, chickadees and nuthatches, but no jays. My one cousin is a birder (and not internet savvy); he said to check the Cornell University site for news, which I will do. I recently realized that I had not seen a Blue Jay for quite sometime where I live in CT. I know that I have not seen any in the past year but it may be longer than that. I use to have several in my back yard. I asked my friends on Facebook if they had seen any lately. From the many replies that I received, only a few had seen were lucky to have seen them. I live in west central Indiana, 2 miles from where I grew up. Blue Jays were always around. I just noticed a couple of years ago that I hadn’t seen any Jays in several years. Theresa, I am always fascinated to hear of their absence in formerly prime territory. On the other hand (regarding abundance), today, while visiting Cape Cod, I saw a flock of 20 heading north on migration. It seems odd that they would be doing this so late in May but they must be heading somewhere that’s still cold. I live in newton iowa i haven’t seen any blue jays sence winter and there seems to be a shortage here i have other friends tell me they haven’t seen any eirther . We have also heard there is some pesticides that causing them to die. if they are killing the Blue Jays what is going to happen, to the other birds? When we lived in Larchmont (Westchester County, NY) the area was filled with raucous blue jays (who often tried to attack our 2 cats) and mourning doves, with their beautiful song. One morning I saw a gorgeous, bright red bird. I looked it up and discovered it was a scarlet tanager. Aren’t they found in the south? Perhaps this one was lost. We now live about 9 miles away in Hartsdale (same county) and what we see and hear are huge numbers of crows. Very noisy, but fascinating. But no blue jays, no mourning doves, no sparrows, and I wonder why. Possible reasons (? ): We are in a high rise complex. Behind is a large stand of ugly locust trees and pin oaks. This area was part of the cicada occupation last summer. Linda, Scarlet tanagers breed all the way up to Canada so they are normal in New York state. However they like wooded areas so they are not in dense cities nor in open farmland. It is always surprising to see one in a city … usually only happens during migration in spring & fall. The absence of blue jays may be habitat related too. I’ve found them in suburbs and in thin woodlands, not in dense city settings. Thank you, Kate, for the info. That was the only sighting I’ve ever had of that beautiful bird. I guess we have always lived in urbanized areas and the only birds to be seen were pigeons and sparrows. And here in the busier suburbs, only crows. Perhaps they scare off everything else. Now that we go to Florida in the winter, I am learning about the residents on our golf course. I usually have numerous blue jays for peanuts and they’ll even hawk at me if the dish is empty. This year I haven’t seen nor heard by jays, what I’ve been noticing is the black birds are still here. They are usually long gone by now. What’s going on? Dottie, I don’t know where you live but it could be that the jays are still nesting. The grackles (my guess at the black birds you mention) have finished nesting and are traveling in big flocks right now. I too have wondered why I haven’t seen any Blue Jays. I live in the St. Louis, Missouri area. I used to see them all the time, but it recently occurred to me that I hadn’t seen ANY in the past year or so. It’s concerned me enough to Google this to see if anyone else had noticed a decline in their numbers. The reason I found this blog was because i was trying to find out what happened to the Blue Jays. We hated them as kids because of their raucus calls and they seemed to drive away all the competition. But I haven’t seen one in years, maybe a decade, maybe more. We have a diverse tree population and now have many birds we never saw back in the 50’s. We have fully mature Broad Hawks and Red Tails and a couple of smaller raptors I have not identified. Where we used to have only Common Sparrows, Robins and Blue Jays we now have the Sparrows, a variety of them, Finches of several types and various Wrens, (sorry, my identification is weak but I can still see the differences enough to note a different bird) This year we have a Western Goldfinch or another bird that looks just like it with out the red cap. We also have Turkeys abundant enough for them to be looking for nesting in the neighbors yard. The hen we saw this year rested in their giant White Pine but there were so many watchers gathering in my back yard for a look that I think we scared her off. There seem to be fewer Robins but that may be because there are so many other birds now. I don’t mention the Crows only because they are ubiquitous no matter the conditions. We are near a cemetery and they have lived there for a century. I learned when I first moved here 20 years ago to leave them alone. They ganged up on my car and dropped on it enmasse for a whole season. (I was trying to get them to stop roosting across the alley.) They are harassed now on occasion by one of the smaller Raptors that has moved in to hunt baby rabbits, our newest pestilence in Minneapolis. But not one Blue Jay. Curious. Any thoughts? Interesting observations, Mike Olaugh. I checked eBird for sightings of blue jays and see that they are most numerous at the southwest lakes (Lake Calhoun & other lakes north & south of it) and the Mississippi valley. Here’s the link that shows where and when they’ve been seen: http://bit.ly/1obTBjn Their absence seems to be localized. Thanks Kate. It looks like they are all around me. It is possible that my old man memory has populated the past with more Jays than actually were there. I did forget to mention the Cardinals that do dominate the morning here. I always thought the two were close relatives but, somehow, Cardinals are good and Jays are bad. Now there is a Visitation thought !! I live just south of Atlanta, Ga. I use to have Blue Jays in my yard and enjoyed their color. I have not seen any in my area for the past two to three years if not longer? Where have they all gone? Karen, according to eBird there are indeed fewer blue jays south of Atlanta than there are in the northeast quadrant. See the eBird link here: http://bit.ly/1sPglWT This is pretty amazing but it might be explained by habitat. Blue jays are very fond of acorns so I’m wondering this: Are there lots of oaks in the northeast area of metro Atlanta? Are there fewer oaks where you live — fewer now than some years ago? It’s now August 19,2014 This past year I’ve seen only 5 blue jays here in North Jersey, Sussex county. I posted back in 2013 that I had only 2. Not a great comeback, but a slight rise in populace. It seems that the Blue Jay is the only bird lacking in quantity. I put up a Hummingbird feeder this year and to my surprise I have about five coming to feed the only problem is the yellow jackets seem to control the feeder and they chase the birds away. I’m hoping for more Blue Jays this winter, I’ll keep posting any increase results. Phil, thanks for the news. Good luck! I live in Mississauga, Ontario, Canada, and I have not see a Blue Jay this year, and noticed in 2013 and 2012 there were hardly any. I am keeping a look out but I think the West Nile disease really affected them. I have feeders up but only have Finches, Sparrows and Cardinals, and one Nuthatch. 3 Humming Birds who are always chasing each other. I guess they guard their territory. I will be interested to see if any come this winter, use to get loads. I found this website when I realized I hadn’t seen hardly any blue jays in the last couple of years. I’m in Minneapolis and growing up is see at least a couple everyday without even trying. I wonder why? I am in Hudson, WI and this is the 2nd winter in a row that I have had no blue jays at my feeders. I saw just one blue jay last spring and it hung around for about 1 day. I am so puzzled and troubled by their disappearance. We’ve had Blue Jays all summer, every day, here in suburban Atlanta but have seen none in the past week. one day they were here; then they weren’t. I live in Louisiana and usually have lots of blue jays and red birds but for some reason I have not seen but 1 red bird. I have noticed a change of all bird sightings now for about 3 months. Where are all the birds? The only birds I see are the hawks flying over. What’s going on? I wonder if it has anything to do with the corn/grain they eat – most of which is now Monsanto BT, I believe. The ill effects are well-documented. No health problems with my pets now that they’re off corn, soy. I miss seeing blue jays here in north Georgia! 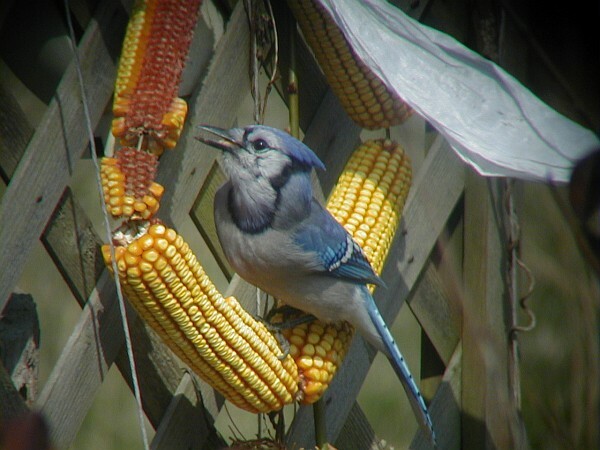 Kim, the BT corn would affect us but I don’t think blue jays eat much corn/grain. Their favorite foods are acorns and nuts. I do know they are scarce where there aren’t nut trees. Thanks, Kate. Maybe my problem is the exploding chipmunk and flying squirrel numbers in my little piece of the woods. The flying squirrels have filled two empty bird houses to the brim with acorns! I have seen nearly NO birds around my house for days. Normally there are hundreds. I recently put out my winter feeders which have gone untouched. This is very earie to say the least! Is anyone else experiencing anything like this? I’m in SE Indiana out in the country where birds are normally plentiful and I usually have 10-30 birds around the feeder. I live in the St. Louis area. I have not seen a blue jay for at least 3 years. I miss them. Wish I knew what happened. Mid January 2015 and there has been no Blue Jays here at the homestead in Bowie Maryland for almost 2 months. They were here in abundance before then feeding on the peanut splits. I’m reading this website because I typed in the Finder what happened to all the Blue Jays? I am astonished and dismayed that I am not the only one that has noticed this. I’ve lived in the Lehigh Valley Pennsylvania, an hour north of Philly, in a rural area with a relatively stable habitat and along a cornfield with literally miles of nearby tree lines for the last 35 years. I’m home much of the day and have seen no Blue Jays at our birdfeeder this year. A few Cardinals and lots of little brownbirds but none of the previous ubiquitous Blue Jays. Reading all these stories leads me to think this is not a problem with dying adult birds but a problem with breeding. Somebody better to figure this one out pretty fast. I am watching a dozen Blue Jays as I write. They are living well here in CT. I just never see them in the summer. First bluejays of the spring just arrived in Palm Coast Florida. There is a pair harassing a crow in my backyard as I write this. abundant in Central Florida. Usually all I would see at our bird feeder were Blue Jays. I also remember seeing Very Large Grasshoppers. I also remember the singing sound of these Grasshoppers. Are Grasshoppers disturbing Blue Jay nesting?????? Does anyone have a theory????? I’m in New Castle Delaware, soon to return to Arizona where I’ve never seen Blue Jays. I have lived in New Castle for over 55 years, where there has always been a very large population of Blue Jays at my feeders. I have not seen even one since coming here June of 2014. When I ask many people if they have seen any Blue Jays, they suddenly realize they haven’t. I found this website by looking up “Where are all the Blue Jays in Delaware”, only to find everyone else looking for the same answer. What could possibly be taking place that we have lost our Blue Jay population? From what I am reading, they seem to missing all the way over to the Mississippi Valley and maybe further and most of the East Coast. Have not seen or heard a bluejay in 10 years in Florida. Tampa area. Now I have not seen any. I live in Greenville, SC, and I’ve noticed fewer bluejays over the years. I can’t remember the last time I saw one. Soooo many Blue Jays! May 28th 2015 Warren,Michigan. I had @ least 10 Large male Blue Jays all chirping and swooping between my Large ash and maple trees in my yard. They were so loud that the noise brought me to my window. Craziest thing! It’s usually rare to see one. Does anyone know why they do this? Glad to hear it! So many comments come from those who are missing them so it’s great to hear from a place where they’re abundant. My aunt and I were speaking this morning and we both love the birds. She brought up the fact that we haven’t seen any Bluejays in quite some time. We live in Sarasota Fla. For years they were very abundant. I haven’t seen one in a couple of years. Disturbing. Spotted three Rosie spoon bills this morning though! Please give us an idea as to where and why have they gone. Beverly Z, Blue jay abundance varies based on time of year. I looked at eBird.org to see what happens in Sarasota County, Florida. The bottom line is habitat. Perhaps the land in your area changed a lot in the the last few years. p.s. about Roseate Spoonbills: You are SO LUCKY to have them! I posted on January 21 about not seeing any Blue Jays for two months and only a day after I posted that the Blue Jays reappeared. They have been around since. I love chatting with them. Today there was a Mockingbird doing a pitch perfect Blue Jay call with all the other calls he was mimicking. I have not seen any at my bird feeder for over two years and I live south of Pittsburgh. I remember they used to bully everyone else away from the feeder. I haven’t seen any around my yard in Wilmington DE in 2014 or 2015. For years there were families of five regularly in my yard each year. I haven’t changed anything in my yard, but several oak trees have been cut down by neighbors. Pam, very perceptive of you to notice the missing oak trees. They’re a good hint as to why the blue jays are missing. I live in southern RI. It has been about 5 years now since I’ve seen a blue jay or heard their screech when in flight. I’ve always had different types of bird feeders and my yard has many different trees and bushes for hiding or nesting. I miss the blue jays! I’ve noticed too that cardinals are waning off too! I wonder if climate change has anything to do with this. Maybe they’re moving elsewhere. Very sad. I love these brightly colored birds. I live in Austin Texas and the blue jays are everywhere, at my office close to the university of texas, at my home in southwest Austin I counted (last Saturday morning) 16 blue jays spreading over 3 back yards and it was so noisy you had to raise your voice to talk. What does so many blue jays congregating mean? Ann, blue jays are migrating so they’re hanging out together. They’re always noisy but it’s amazing that they’re that loud! The answer is avian influenza. Do you remember the bird flu scare a few years back? Well, when people we worried about catching the bird flu, the CDC collecting dead birds. Blue Jays, sparrows, crows, and others were carriers for the flu. Blue Jays were quite vulnerable to the flu and suffered a drastic population loss, which is why many of us haven’t seen Blue Jays recently. We’re in the foothills (1500 ft) of Mt. Hood, OR & our stellar’s jays have disappeared this past month-what’s up? They were here during the winter & we fed them peanuts/birdseed everyday and have for nearly 20 years. They used to come when we called them and as well hung out near our windows & decks to wait for their treats. There was a mountain bobcat in the back & we only feed in clear areas or on an upstairs deck now to no avail. The weather calmed dramatically after a hard freeze and we’re flabbergasted by this behavior. Any insight/ideas would be greatly appreciated. Thanks kindly, Scooter ? Scooter, I don’t know why they would leave but they travel in family groups and are very intelligent so they will leave if they feel threatened. Here are two informational websites on Steller’s jays. Maybe they will give you a clue. This one is long: A study of Abundance, Nest Sites, and Nesting Success of Steller’s Jays Along a Gradient of Urbanization in Western Washington by Vigallon & Marzluff, University of Seattle, Wshington. Rarely see bluejays at the backyard feeder any more. It’s been like this about 3-4 years. Same with the painted bunting. Haven’t seen one of those in 8-10 years. I live in Central FL all winter they came to feed they loved the peanuts. Along with Doves Cardinals finches wood peckers and squirrels. In the morning I would call Jay they would come and get their peanuts along with other bird food we provided. For the past week they are no longer here. I say we had 10 at one time. Just for the record they are the least aggressive bird that has come to visit. Can anyone tell me why they have now left? Anne, they are migrating north. Some of them will go to Canada to nest. I live in the mountains of Western N.C. and in the past years have seen a few blue jays come to my feeders over the summer. All of a sudden this week I have been flooded with them. At one time there were 10 -15 of them sitting on the rails,gathered together eating. Why all of a sudden are there so many? Can’t seem to find any information on this. Lani, blue jays migrate during the day and they’re on their way north right now. They travel in very loose flocks so we usually don’t notice it until they all land at once. Wow! I have lived in Conroe, Texas for 50 of my 55 years. We are about an hour north of Houston. I suddenly realized recently that I haven’t seen a bluejay in years maybe 5 or 10. Prior to that, they were always around, dive bombing my cats. I also realized that I haven’t seen a robin redbreast in a couple of years. I’m very upset about the bluejays. I recently moved 35 miles west of Conroe, more in the country, and still have seen neither bird. What happened? Notice how they pretty much disappear in west Texas! I used to have many blue jays visit my feeders. Haven’t heard or seen one in so long. I was wondering if there was something killing them off when I saw this article. I live about 60 miles north of Pittsburgh. Brenda, apparently the jays move around a lot. There are lots of them in my neighborhood right now in the City of Pittsburgh. I can tell from the begging/whining noises that they raised young here this year. Wish I would see one, I’d feel better then. Thanks for the info! I have seen maybe 4 Blue Jay’s last two years, and Crows are scarce,too.I used to have many of both, they take care of alerting all birds, small animals of threats. What’s going on?! I live in central NC and just found this thread. I grew up here and all my life we had a large Blue Jay population. In the past 5 years I’ve only spotted a dozen of them?? Something is up. It’s disturbing. I live in central SC on a lake and we used to have many blue Jays every year but I was just commenting to a friend that I had not seen any in a while and they agreed. This area has exploded lately with developers coming in and totally clearing all the trees to build rows of houses. They say they re-plant but the trees and bushes they plant and the pristine yards they put in, most of our wildlife cannot live in. I am not sure if this is why we have not seen them but other animals, of course, have vanished as well. I have quietly started a campaign suggesting that everyone have at least a small section of their yard left natural and to its own devices. And please quit cutting down the trees! If you want to live in a desert, which is what will happen if we keep cutting trees down then go live in one! Thanks! I am so grateful that others care and I am grateful for the bird population that is still hanging out here. We live at Michigan’s longest Long Lake located in both Alpena and Presque Isle counties. We have not seen any Blue Jays since the end of 2015! Until now we would observe 15 or more Jays at our feeders at one time on a regular basis. I see all of the questions about the lack of Jays but no answers? For many years here in northeastern MA, blue jays were very common. Over the last few years, for some reason, they’ve become rare. Cardinals, on the other hand, went from being a rare sight to being fairly regular visitors. We live in Gainesville, Georgia and have had blue jays every year except this one. I have an abundance of cardinals and sparrows but no bluejays for 2 years. I used to enjoy watching them with the spirrels when I threw peanuts out in the yard. It was cheap entertainment there so funny…lol miss them! I am in lower Bucks County PA. I have seen only one Blue Jay and only the one time, this year (2018). I remember also remarking in the autumn of 2017 that I had not seen many during the summer. Anyone have any further comments or explanations? I saw one or two in Monrovia Ca, about 2-3 years ago. I used to see them daily when i was a kid but that was about 40years ago. I really loved blue hues and wing span. I really miss them. I live in a highly wooded area in Carroll Co. Oh. and this winter I’ve not seen any Wood peckers, Titmice, Chickadee’s or Nuthatches. Any suggestions as to what is going on? I usually have 40+ birds at my feeder. The only birds there are 2 Juncos and 1 Dove in a week . Rob Warner, I have a few ideas but you’ll have to do some sleuthing to figure out which one is right: (1) habitat change — their habitat near your yard or in your yard was removed, (2) predators — something new and dangerous has shown up, a hawk, a cat, etc. (3) something killed them slowly so now they’re gone — this is least likely but is always possible. I live in Naperville, IL. Last summer (2018) I saw a mating pair of Bluejays in my backyard. Tragically I found a baby bird dead and mauled. The parents did manage to rear and fledge one chick. I hadn’t seen a Bluejay in 7-10 years. I rejoiced. I was deeply saddened that none of my neighbours recognised the relevance of the occasion. I had thought Bluejays were lost to us, I pray they return to us in 2019.